One of the most fascinating aspects of personal finance is the fact that it is comprised of individual stories, goals, wisdom, and opinions. I have read certain bloggers state unequivocally that if you have not experienced debt, your authenticity as a personal finance blogger is questionable at best. I’ve also seen readers lambaste bloggers in comment sections for not acknowledging enough of the privilege that they were born into. Debates and controversy abound. And when it comes to lightning rods as financial figureheads, I’m not sure anyone fits the bill better than Dave Ramsey. So what I want to know is does it really matter where Dave Ramsey lives? Dave Ramsey lives in a really big house. On a hill. In an idyllic place. Perhaps where the eyes of all the people are upon him. * They certainly were when the interwebs blew up with news of his home purchase several years back. To this day, the hot-button issue lives on as one quick Google search can prove. So, is it hypocritical for a personal finance guru to live in a really big house? No. Even if it is worth over a reported $4 million? No. Even if it supposedly contains 18** shower heads? No. As mind blowing as the home seems from my perspective (Who cleans it? What do you put in it? Why on God’s green earth would anyone need that many showers? ), the fact that there was no mortgage on record for the purchase seems to indicate that he is living well within his means. If that’s what he preaches, then how can anyone be upset? Over the past two weeks, I’ve seen a resurgence of Dave Ramsey quotes on Instagram, Twitter, and Pinterest. Twitter also keeps suggesting that I follow him. *** In addition to underscoring the fact that I’ve got to find better things to do with my time, this recent Ramseymania compelled me to try to flesh out my thoughts a bit more. Here is where I get stuck. On one hand, I get it. He has the money to afford the house. He probably has enough money to buy the whole town. And if he can afford it, who am I to tell him how to spend his money? Truly, even if he can’t afford it, who am I to tell him how to spend his money? On the flip side, if he is going make public declarations that paint in broad strokes about society buying unnecessary things, how does he justify buying something so extravagantly unnecessary? Maybe he didn’t buy it with the intention of impressing anyone. He certainly has the money for it. But you’d be hard pressed to convince me that he needed this house. Does that matter? I still don’t know. *If you don’t appreciate what I did just there, ask Dave. He can explain it. **In all fairness, I’ve not seen the house firsthand. As a result, it may contain more or less shower heads than reported by various news sources. 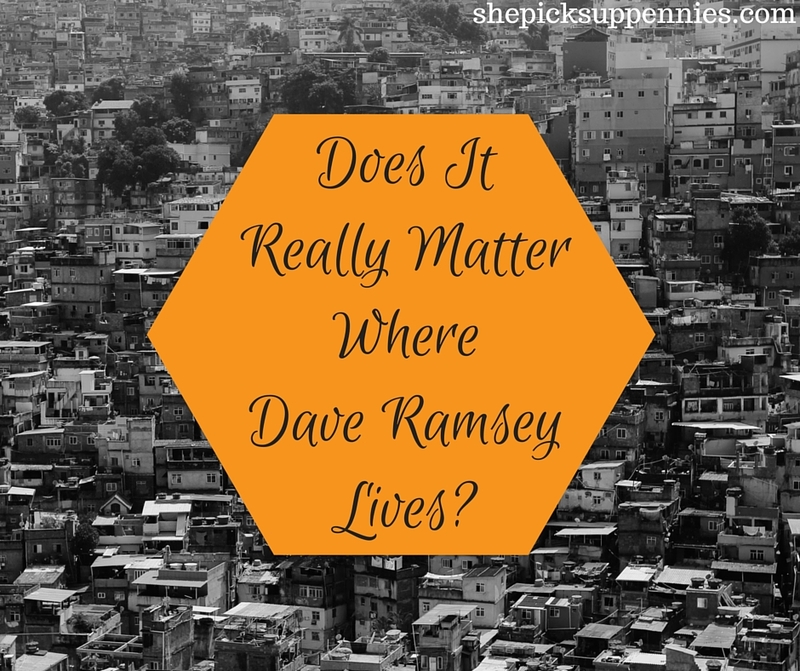 So Tell Me…Does it really matter where Dave Ramsey lives? In my opinion, I really don’t give a wit where Dave Ramsey lives, what he says or the choices that he makes in his life. It’s his life and he can do whatever he feels is best. It is not my job to judge his money decisions, nor do I feel particularly responsible or obligated to consider whether or not he “needs” that house. The fact is in today’s society, good or bad, NEED has very little to do with our buying decisions. Remember, Dave doesn’t preach minimalism. He preaches investing and getting (and staying) out of debt. Besides, I don’t think this situation is any different from some of those TV preachers or televangelists who use their religion to extract money from their hapless followers, only to find out that these individuals have huge homes, expensive cars and fly in private jets (or in some cases, have their own jet). Dave talks about a different subject, but really, it’s all the same. To me at least, it doesn’t matter where Dave lives. If Dave lived in a shack, that wouldn’t make me any more or less likely to listen to his show (I’ve heard his show, but don’t listen to it routinely because I no longer commute into work for a living). Yes! My mind totally “went there” with TV preachers, too. I’m not opposed to personal finance peeps making and spending money in the least. Frankly, I don’t think it’s my place to tell anyone how to spend their money (oh, the irony of the blogging world!). But it does make me scratch my head when I see that quotation plastered everywhere. It makes me give pause to the things that I write. Obviously, a blog is such a small part of who a person really is. So it’s interesting to see society try to boil people down into a single quote. The blessing and curse of Pinterest, I guess! What an interesting question. I know people who have been able to use Dave Ramsey’s advice to turn their financial life around, and are much more financially literate for going through the Financial Peace program. His advice has been effective for many people, and he deserves to reap the rewards of helping others. Those huge houses are completely outside of what most people experience on a daily basis, though. Whether he can afford the house or not, it’s odd that he has consumed conspicuously when the desire for an upmarket lifestyle is what drives so many people to debt. I have to wonder whether he can continue to be as effective a teacher when his lifestyle diverges so much from the people he is trying to reach. I imagine there are a lot of people who probably see his house as the ultimate goal, and I bet it makes him seem even more persuasive. It’s interesting to think that some people might consider him out of touch with their reality. So glad you continue to share your ideas! I love hearing from you. I think it’s dangerous whenever you start viewing another person’s choices through your lens and your past experiences. Are his words able to stand up on their own? Yes. The only difference is that knowing where he lives, someone with an agenda can use it to add color to their own message. It’s like knowing Warren Buffett lives in a decided average home in Omaha. This guy is worth billions and lives in a typical home. It only matters because it allows someone to add more color to their story. So that’s the only reason why it matters, it gives you a little hint that the people who bring it up might have something else on their mind. Your point about perspective is so keen. We all have biases, don’t we? I don’t know that his words stand up on their own when it comes to the defense of his house. His house is an unnecessary thing. But, all of this seems to be a lesson in context. It’s such a quotable concept that it’s been spit out all over social media. Unfortunately, there’s no larger picture to reconcile anything against. Bringing up Buffett’s house is so interesting, too. It’s not really my business where or how anyone lives, but I suppose if I had to choose, I’d pick to take advice from the purchase that seems more logical to me. I’d imagine there are many people who think Buffett is foolish for not indulging more. Oh, I could go on for days countering the debt thing even though it’s not an argument I’ve personally seen. Wouldn’t it validate your money knowledge more if you had completely avoided it? And I think the privilege argument is valid IF you’re saying, “Anyone can do this! You’re just not working hard enough!” Then it needs to be countered that the income and culture you grow up in absolutely affects your opportunities. The closer your proximity to opportunity, the higher your chances to run into that little bit of luck that’s necessary to make hard work pay off. I’m not someone that worships the ground Ramsey walks on, but if he can afford it, especially without a mortgage, why not? Maybe it’s excessive, but it would appear the decision isn’t putting his finances in jeopardy, so in this situation I don’t see hypocrisy. I love all of your points! I wouldn’t call it hypocrisy per se, but that quotation that frowns on the unnecessary is where I get stuck. Still, I completely acknowledge that Tweet-worthy quote is one small sound bite in the cosmos of all the things he’s preached, so it’s probably not fair to make that the deciding factor in anything. I don’t even think it was he that said it. Wasn’t that a quote from Chuck Palahniuk’s Fight Club? That could be why you’re feeling malease. Radically different philosophy than Ramsey. Haha true. I read a lot of Palahniuk in high school, and could swear that was in there. Came out in 1996. Ramsey also uses a lot of quotes from Psalms, I believe. Mostly sound money advice. Just feel like a lot of it is aggregated. *scary in an awesome way. You pose a great question. I don’t think it’s hypocritical at all for him to live in a huge mansion overrun with shower heads! He’s not a minimalist. He tells people that once their financial lives are in order and they know what they’re doing, they can have the life they want. So a megahouse on a hill that lacks a mortgage? Totally in line with what Dave teaches, in my opinion! Generally speaking, I completely agree. It’s just that quotation that I saw ad nauseum this week that seems to frown upon the unnecessary that makes me give pause. So glad you chimed in! I’m with you Penny. It’s hard not to be just a *little* judgmental when you consider it’s not just a very nice house, it’s well on the way to being the size of a medieval castle keep! Unless there are half a dozen families living in that ‘house’, that seems excessive. This reminds me of people asking the question, “why should I listen to a financial advisor who isn’t so wealthy that he doesn’t need to work anymore?”. We’re not all living the same lives with the same goals and the same timelines. While the financial advisor may be able to give you good advice for what you want to accomplish, that may not be the same as what they want to accomplish. I’m neither a fan nor a critic of Dave Ramsey, but as long as his advice genuinely helps people, he’s not swindling them to make his income, and he wants to buy a ginormous house with his money, then that’s fine by me. That’s such an articulate comparison! I don’t think it matters where he lives. If someone is happy and they can afford it, who cares? He also says to live like no one else so later on you can live and give like no one else. If a person can afford it, has no debt, then whom are we to judge? I watch his show on his website, he seems to be genuinely happy, his daughter Rachel Cruze works at his company and so does her husband. He puts her on his show from time to time. He co-wrote a book with her too. Yes I’m a huge Ramsey fan. I can’t help it. My favorite part of his show are the debt-free screams, average middle-class to upper middle-class families that get out of debt. He’ll have callers that make $40,000 and in three years they have a $30,000 emergency fund and are debt free. mid-west or anywhere without a credit card check and credit score check. I like the Dave Ramsey show, but I also like to read blogs about people that are getting out of debt, saving, invest in the present day and trying to be financially independent. I like knowing different perspectives and learning from different people. Your perspective is fantastic. I definitely understand why many people are fans. And I think reading widely is really important. One person might unlock a lot of strategies, so imagine what many people can do. That’s the wonderful thing about the PF world. Personally, I’m in the camp that it matters not at all what kind of house he has. Who knows? Maybe he needs 36 000 sq ft (I made up this number) to live comfortably for him. We all have different needs. Maybe he doesn’t take vacations or wants his entire extended family to live with him. I’m also a person that’s working on the privilege thing. As someone without a lot of the resources others seem to have had when paying down debt, it’s hard for me to take them seriously when they give advice. But, I’m working on it, because we’re all human and I think we’re all just trying to make the best of it. When I think someone doesn’t deserve the success they’ve gotten from something, it often ends up that I’m just jealous of the situation they found themselves in…and often we can’t control that. As for Dave Ramsey, I’m just glad he’s helping people get out of debt. I think part of what many people don’t really look at is, maybe, that house brings him true happiness. Maybe it provides a level of fulfillment that we just don’t understand (or have the backstory to). Is it any different than if someone was able to buy a BMW in cash and it was truly something that brought them joy? What about a weekly trip to see a new release at a movie theatre…is that okay? While it is easy to look at a large purchase such as his and have a negative feeling toward it, aren’t most people trying to become financially independent so they can put their money towards the things that bring them joy? Or maybe even something more basic, like security. Some people who have had issues keeping food on the table, and then become financially comfortable, begin to stockpile food. It offers them security, a sense of well being that they have enough food to get by for a longer period of time. Buying food that way may not be a NEED, and may even seem a bit over the top, but would someone consider that to be wrong? Also, is it more inappropriate for him to buy a large home he can afford and support than it is for someone to buy a home with a mortgage that fits comfortable into their budget? The idea only seems shocking because the VAST majority of us don’t have the kind of income Dave Ramsey does, so it seems extravagant when compared to OUR financial realities, not when compared to his. I don’t object to any of the points you’re making at all. I still don’t really know how I feel about his house. Nor does it really matter – it’s HIS house 🙂 I do think, though, that given the context of that quote, anyone would be hard-pressed to file a purchase like that in the “need” column. I think the reason this wealth doesn’t sit well sometimes is because Ramsey’s brand is built on being relatable and accessible for everyone. The whole point of his plan is that it works for everyone (although is perhaps more conservative than everyone needs) which I intend to write about soon. Such a house doesn’t sit well because, regardless of how well people get out of debt, not everyone is making an income where they could afford a house, nor should they. It’s not hypocritical, nor should that bother anyone, but I think it would. My thoughts on him have changed SO MUCH since I wrote this post. I probably should write an update, but I know there are many Dave loyalists in the PF crowd. I don’t really care where he lives, but I do think staying “in touch” matters. But ultimately, who am I to judge?